If it’s humour you’re looking for, Chief Daddy is guaranteed to serve you with loads of it. Powered with an ensemble of Nollywood’s who-is-who and directed by Niyi Akinmolayan, Chief Daddy delves into the family drama that ensues upon the death of Chief Beecroft – the titular character. It’s a rich area with ample opportunity for exploring a wide range of scenarios. As relatable subject matter based on the aftermath of a wealthy philanderer’s death, the first act is bound to excite you and leave your mind imagining various possibilities but at the end of this film, one is likelier to feel like someone whose favourite footballer misses a sitter in a title decider. It’s a major challenge of comedies in Nollywood. Sure, you want to make the audience laugh but even at that, humour is meant to be a tool that advances the plot, not just an element that’s sprinkled around just for the heck of it. Where’s the conflict? How will the key characters arrive at that point and reach a resolution that hits the mark. It shouldn’t just be LOL and nothing else, and this is where Chief Daddy, like most similar movies that came before it, struggles. One gets the feeling that the casting decisions were more commercially driven than artistic because there are too many top actors cast as characters who seem interesting but have too little to do. Folarin ‘Falz’ Falana, Funke Akindele, Kate Henshaw, Rachel Oniga, Joke Silva, Nkem Owoh, Patience Ozokwor and Linda Ejiofor manage to pull off memorable performances but the others, while putting in commendable shifts, wouldn’t necessarily be missed – even with Ini Edo being a literal sight for sore eyes. Nedu and Chioma ‘Chigul’ were fun to wa tch but even that got tired too quickly, no thanks to some unnecessary scenes. It’s a classic example of too many cooks ruining the broth. Still, the movie does well technically and scores high for editing, sound, cinematography, costuming and acting (or overacting as some cases might be. One would only wish it were matched by a really good story. Alas, it feels like The Wedding Party all over again, only that this time around, a burial was used as an excuse to throw a party in which characters put on show their epic worst behaviours. In the end, the experience is that of a weak story dragged along on a tortuous journey with the combined strength of one-too-many brilliant actors only to arrive at a flat resolution. The shoe-horned product placement didn’t help either – yes, the audience gets it but there has to be a better way of projecting a major sponsor. Even Instagram skit peddlers fare better. And the cliff-hanger at the end? Best to not go there but as it suggests that a sequel should be expected, perhaps, a counter-suggestion would be for it to be devoid of the many faults of its forerunner. 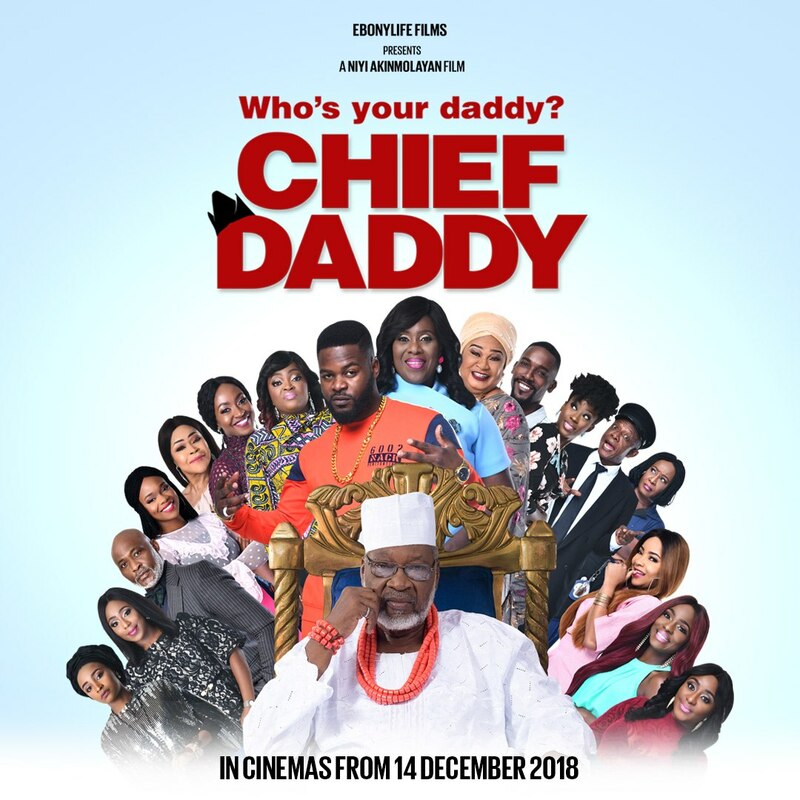 Chief Daddy is a fun watch – pretty enjoyable even – for anyone in search of humour and mindless entertainment. The problem is that it pretends to be more than it is only to not meet up to expectations. Deoye Falade is a communications professional and writer whose work has spanned both mainstream media and corporate sector. He was among the 20 Young Critics trained by the International Association of Theatre Critics during the 2017 Lagos Theatre Festival. He also contributes features and movie reviews for True Nollywood Stories, AfriReviews and other top media outlets. When he’s not being lazy or up to some mischief on social media, he pretends to express a sane literary side on his blog. PreviousPetr Cech to retire at the end of the season. NextCristiano Ronaldo pleads guilty to tax fraud. Our year of abundance is here. Happy New Year People.